Washington-based Karp never got much credit for their work and part of it can be attributed to constant comparisons to Melvins, to the point where many saw band as nothing more than Melvins clone. However, band lasted for quite a long time and after their dissolution, few members actually ended up playing in Melvins, as well as Big Business, with whom Melvins shared the stage. Karp formed in Olympia, WA (Tumwater, WA, according to sources other than Wikipedia) in the early 90s. It consisted of Chris Smith, Jared Warren and Scott Jerrigan. Their first full-length was 1994 “Mustaches Wild” (preceded by “Freighty Cat” / “I’m Done” 7-inch singles). 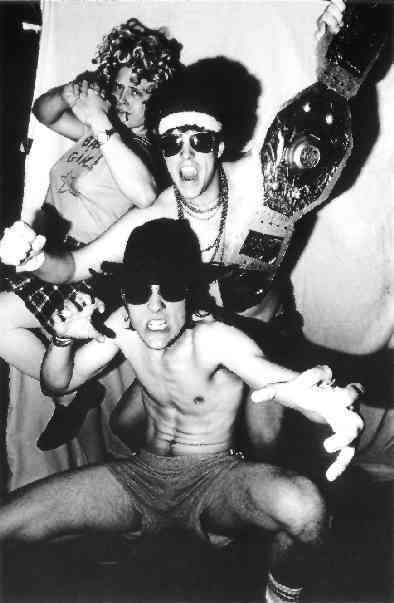 Due to personal conflicts they broke up in the late 90s due to personal conflicts, with members moving to a number of other projects/bands including The Whip, Melvins and Big Business. Drummer Scott Jerrigan died in a boating accident in 2003, some time after finishing 7″ with his band The Whip, which also included Joe Preston. Jared Warren formed The Tight Bros Way Back When and later joined Melvins/Big Business. – Their name comes from newsletter/zine that Chris Smith was working on in high school. It stands for Kill All Redneck Pricks.